On April 5 I wandered onto a sunny knoll to see if I could find any leafminers in the various plants with new or overwintering basal leaves. I found several, one of which was a moth larva in a woodland sedge (Carex laxiflora, or something similar). …I’m told it is a male developing into a pupa. I have since found these several times on sedges, always solitary, but I have no idea what kind they might be. Anyone out there good with scales? Photos of two others are linked at the bottom of this page. Anyway, normally when I try to raise a leafminer, I just collect a single leaf, but this leaf was already in pretty sorry shape, and I was worried it would dry out. So I decided to dig up the whole plant, pot it, and enclose it in a sealed plastic bag. From the form of the crochets of the larva in your photo, it looks to be a neonate of some macro (most likely a noctuid). The fact that those larvae died within 24 hours is strong evidence that they represent a species that does not feed on sedge; it doesn’t take neonates long at all to give up the ghost if they can’t hook up with their foodplant post haste upon hatching, and I suppose that is what happened here. The wasp may have been associated with the larva; remember, even though the wasp larva doesn’t kill the host larva until the latter is in the final stage of larval life, the wasp egg is actually laid into the host very early in its development (usually first instar, or even egg). Based on the info that we have about it, it is of course a complete coin toss as to whether or not the wasp really was there to hit that species of larva, but it is at least possible. Apparently it had been overwintering burrowed in the soil, and had finally woken up. Browsing on BugGuide.net, I guessed it might be Amaurochrous cinctipes (Pentatomidae), which D. B. Thomas confirmed, adding: “Finding it with sedges, more interestingly hiding down in the roots, is a very good record. Some rice bugs do the same thing.” BugGuide does not have much information on this species or genus, but it belongs to the subfamily Podopinae, known as “turtle bugs.” Their habitat is said to be “swampy areas,” and there is a note (based on a comment from D. B. Thomas) that “mosquito abatement practices (drainage, sprays) may have decimated these rare bugs.” As I already mentioned, this sedge was not in a swampy area but on a sunny knoll, so I wonder if these bugs are really just associated with sedges, many of which happen to grow in swampy areas. On May 14, a beetle (2.7 mm) and a fly (6 mm) appeared in the bag. Vassili Belov has tentatively identified this as Lupraea picta, one of the flea beetles (Chrysomelidae: Alticini). A few members of this tribe are leafminers as larvae, but others feed on roots, and I suppose that’s where this one came from, though I haven’t had a chance to look into whether this species is known to feed on sedges. I had no clue what this fly might be, but Ross Hill quickly identified it as a dung fly (Scathophagidae) in the genus Cordilura, noting that “their larvae feed in the culms [stems] of Scirpus and Carex, both of which are sedges.” This was news to me–as far as I knew, the family’s common and Latin names described the feeding habits of all of its members. With a little investigating, I learned that these flies lay eggs on developing sedge stems, the larvae mine within, and they overwinter as pupae in the hollowed-out base of the stem or in soil around the plant’s roots. They vary in their host specificity; for instance C. deceptiva only feeds on tussock sedge (Carex stricta) whereas C. varipes larvae have been found in ten different Carex species. (One species, C. praeusta, feeds on a rush (Juncus effusus) rather than a sedge.) I also came across a paper about another scathophagid, Orthacheta hirtipes, that lays eggs singly at the tips of Carex stems containing Cordilura larvae. The Orthacheta larva bores down the center of the stem, feeding on plant tissue as it goes, but then it eats the Cordilura larva when it catches up to it. I’ve often wondered if there are many sedge-feeding insects, and here is an example of not just a whole genus of sedge-specific flies, but another fly that is specific to sedge-specific flies! I’m building a photographic menagerie of sedge-feeding bugs, but I’ll save those for another post–this one is devoted to the fauna of one individual sedge plant. 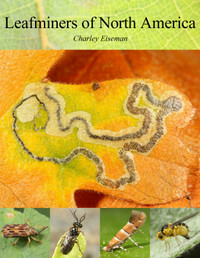 On May 23, seven weeks after I found the leaf mine, the Cosmopterix emerged. Terry Harrison confirmed my hunch that this is Cosmopterix clemensella. This species has been reared from several Carex species, but Annette Braun first reared it from C. laxiflora, which is what my moth’s host likely was. C. clemensella larvae begin mining in the fall, continuing until they are frozen, and then resume when they thaw out, until they’ve munched sedge tissue to their hearts’ content. Braun wrote that they pupate “in a wrinkle in the leaf,” but I never found exactly where this larva had hidden itself. 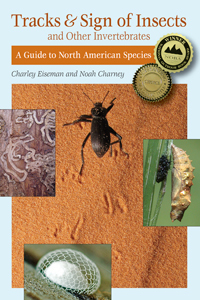 This entry was posted in Uncategorized and tagged Alticini, Amaurochrous cinctipes, beetle, Carex, Carex laxiflora, Chrysomelidae, Coleoptera, Cordilura, Cosmopterigidae, Cosmopterix, Cosmopterix clemensella, Cyperaceae, Diptera, dung fly, Eulophidae, flea beetle, fly, larva, leaf beetle, leaf mine, Lupraea picta, moth, parasitoid, Pentatomidae, scale insect, Scathophagidae, sedge, stink bug, turtle bug, wasp. Bookmark the permalink. When I first saw the first photo I thought it was the mine of a Taphrocerus jewel beetle larva, which make similar mines in Carex and other sedges. The egg is laid under a black cap of sticky residue that looks like a scale insect, so the scale right at the beginning of the mine really threw me. I have yet to find a Taphrocerus mine, but I’m on the lookout! Do you ever find them in upland sedges? Everything I’ve read (including your 2004 paper) has given me the impression that I should be looking in wet places. I have swept Taphrocerus howardi abundantly from sedges in glade habitats (yes, there are sedges in glades – probably associated with seeps). However, I have yet to find larval mines associated with the sedge stands from which I’ve swept the adults. Nevertheless, they must be there because I rarely find this species in moist habitats. It is perhaps our smallest Taphrocerus, so the mines must be very indistinct and difficult to discern. I’m going to try again this summer at a nearby spot where I’ve collected many adults in the past.